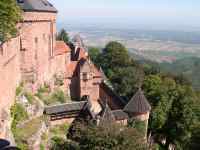 The Haut-Koenigsbourg Castle has a history going back some nine centuries, built in the 12th century as an Austrian fortress. The castle is perched dramatically on a mountain, clearly designed to be defended in times of war and with sweeping views of the Alsace plain below. This impressive fortress has been visited and owned by several notable royals and has changed hands between nations many times. It has also been all but destroyed twice in its long history. The Alsace region was annexed to Germany in 1871, and the castle, at the time only a majestic ruin, was gifted to Kaiser Wilhelm II in 1899. Seeing it as a symbol for Germany's new power in the region, the Kaiser fully restored the fortress and today it is once again a formidable and impressive place to visit. The present structure of the castle gives an accurate idea of how the mountain fortress must have looked in the Middle Ages. Its interior walls are decorated in a rich medieval style, and it houses an extensive and interesting collection of weapons and furniture, mainly from the 16th and 17th centuries. Visitors can view the royal apartments, kitchen, chapel, ceremonial hall and armoury, as well as the walled garden, forge and mill. Exploring this historic building, which has been scarred and marked by the region's history, is exciting for the whole family.